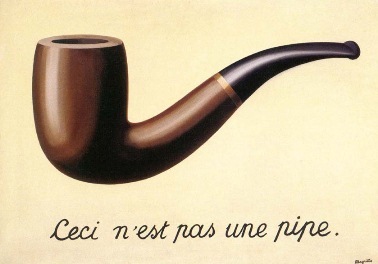 To paraphrase René Magritte, ceci n’est pas un blogue corporate (this is not a corporate blog). Why do I bring this up? Because today I saw a post by Richard MacManus on ReadWriteWeb entitled “Report: Corporate Blogs Not Trusted” and a similar post by Joe Wilcox about how to “Make Your Corporate Blog Believable“. They cite a report from Forrester that company blogs represent the least trusted information source, down at 16%. Actually, personal blogs don’t fare much better at 18%, but I’d like to use this report as a pretext to talk about what it means to blog as an industry professional. Frankly, I don’t think corporate blogs, at least as they are conventionally understood, are a good idea. Companies put out press releases that no sane person would trust as an objective information source. A corporate blog is just a repackaging of a press release web page, trying to masquerade as something more hip. I don’t think it fools anyone, and I’m not aware of any corporate blogs other than the Official Google Blog that have significant readership. Bloggers are people who speak with individual voices. And industry professionals are still people, regardless of their corporate affiliations. I am no more the voice of Endeca’s public relations department than Greg Linden is the voice of Microsoft’s or Matt Cutts the voice of Google’s. Of course, I have my point of view, which unsurprisingly has some alignment with my employer’s overall vision. When I advocate for HCIR, I don’t make excuses for the fact that HCIR underlies Endeca’s approach to information access. But I speak as an individual and in my own voice. When I blog, I put my own credibility on the line, and I cultivate a reputation that extends beyond my corporate affiliation. I think the interesting question for companies is not whether they should publish corporate blogs, but rather whether they should encourage their employees to publish personal blogs that relate to the work the company does. As someone who has been involved in the development of Endeca’s core intellectual property, I understand the reservations that companies have about letting their employees publish. But I think that companies are often too conservative, and incur an enormous opportunity cost in the name of protecting trade secrets. Letting employees blog (and, more generally, publish) not only provides the companies with free marketing, but also provides employees with an avenue for personal development. I’d be curious to hear perspectives from readers here who work for companies. Perhaps I’m lucky to work for an enlightened employer; do most corporate citizens get the memo from Legal saying that blogging is something only the marketing department should do? Has anyone else noticed the poor statistics that they’re using? “Trust” is treated as a 4 or a 5 on a 5 point Likert scale, that is, anything above neutral. This means that lots of people could slightly trust a source and it would show up above something which a smaller number of people trust quite a bit and others are neutral on. Why not just show the median scores for each? I’m not surprised that the research is a bit sketchy. But I’ll also plead guilty to using the report mostly as a pretext to make my own point. It kills me that so many people assume that blogging + corporate affiliation = corporate blogging. Same goes for Twitter. I am an IBM employee, and admittedly, I am constantly paranoid about their legal department. Being the corporate beast that it is, IBM has developed a huge bureaucracy that is often unexplainable. It is not always quite clear what IBM owns and who has authority to do something about it. For example, I have two personal software projects that I have begun during my employment there–which I have cleared with my manager–but I am consistently given conflicting advice on IP ownership from trusted sources. I suppose my blog is no different, and I should probably talk to my manager about it. Nonetheless, I try to keep these personal activities under the radar. The single time IBM is mentioned on my blog is on the “About” page, even though I have tons of material I could write about them. Comparing “personal blog” or some random “corporate blog” to “personal email sent from a friend” is pretty much like comparing “advice from gin-soaked hobo” to “what your mama always said.” The fact that Forrester can get away with presenting something like this and suggesting businesses act on it to shut down their blogs bothers me. It seems to me that 16-18% trustworthiness is not bad when you consider that much of the time you do a Google search for some product you hit a splog. That’s probably the only experience 80% of people have with blogs. Of course, that’s wild speculation, but this straw man study has gotten under my skin. 😛 And I do acknowledge that there is a huge amount of untrustworthy information in blogs, but I’m not sure that it’s much different from other user-generated content. I agree that the study seems pretty questionable. But even if the study is hopelessly flawed, it seems pretty obvious that intelligent people read corporate blogs with the same skepticism and lack of interest with which they read (or don’t read) press releases. But I have no idea how that works in practice. Agreed. Skepticism is always necessary. I’ve written some of the blog posts for our “corporate blog.” I freely admit the first few I wrote did tend to be like a press release, simply announcing new features or improvements to the parts of the system that fall under my domain. However, my most recent posts have been quite technical in nature. With a little extra analysis and some work on the writing, I could easily imagine repackaging them into a paper or poster submission at an academic conference. I guess I’m saying that corporate blog posts should be interpreted carefully, but it is probably unfair to say that all corporate blog posts are simply repackaged press releases. Two great examples of “corporate blogs” that regularly publish content that can’t be characterized as press releases are LexaBlog ( http://www.lexalytics.com/lexablog/ ) and the LingPipe Blog ( http://lingpipe-blog.com/ ). I also have a personal blog. Like Daniel, the voice of my blog is my own. Yet mSpoke, my employer, does recognize the value of me increasing my visibility through blogging. I agree that encouraging employees to blog is a good way for a company to get cheap marketing. There’s usually quite a lot that can be discussed without jeopardizing core intellectual property. A small majority of people in any company are content creators. In my opinion, companies should encourage employees to blog on topics of interest to the company. It is a way to build the company’s credibility without being a marketing machine. If the blog goes to all out marketing/sales, all credibility goes out the window. Paul, I’ve posted the occasional marketing message here myself, but even then there’s usually a personal angle, e.g., I or one of my close colleagues was significantly responsible as an individual contributor. There’s nothing wrong with expressing pride in your employer’s accomplishments, as long as it doesn’t cross the line into advertising. I suppose it’s a slippery slope, but I think people can tell when they’re being marketed to. I’d like to think that readers here would let me know if I crossed that line. The blogs you cite (LexaBlog, LingPipe) are excellent examples of corporate blogs done right. In fact, I have them both in my reader.